That a man is a house-boy to an embattled Oga does not mean that he should be entitled to his own facts. It was Scot of then Manchester Guardian who explained in 1921 that “comment is free, but facts are sacred. Dakuku Peterside is free to jump from one radio station to another to spend funds illegally acquired from the the Rivers State Ministry of Works and NIMASA, but he cannot create his own facts in the process. Facts are sacred. They are known to all. In Rivers State, the fact is clear. Governor Wike has worked. He has performed, transformed the Rivers landscape and made it the destination of choice. Everything that is within the purview of the State Government has been handled with expertise, accountability and utmost integrity. It is a fact that Governor Wike is Nigeria’s best performing governor. I challenge Dakuku to point at any other governor in Nigeria for a head-to-head peer review. We are not talking about shouting yourself hoarse in a radio interview. The hard fact is– no governor in today’s Nigeria can equal Governor Wike. We owe it a duty to the society to correct Amaechi’s house-boy whenever he desecrates the arena with blatant lies. Before I forget, Dakuku aside being tied to Amaechi’s apron strings, is an agent of the worst Federal Government in the history of Nigeria. A Federal Government that is fuelled by lies. 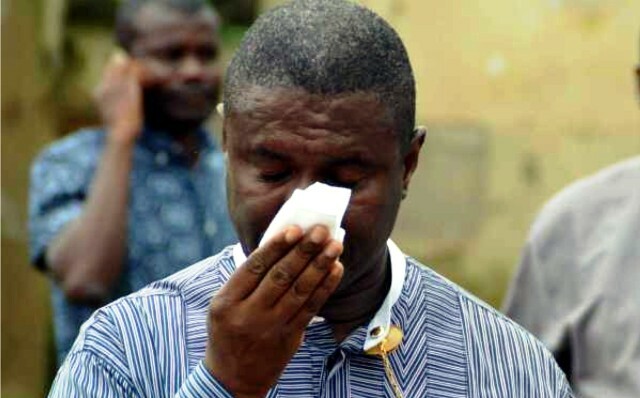 Little wonder, Dakuku Peterside lies with a rapidity that is embarrassing. In one breadth, Dakuku says that Wike has not constructed a single road. It was in the same Rhythm FM Viewpoint Programme. Months later, Dakuku resurfaces to admit that Governor Wike is working, but this time, only reconstructing near-to-be completed projects. At least, we are getting somewhere. The inconsistencies of Dakuku are irritating. How can a man who aspires to be a leader lie with reckless abandon? The Obiri-Ikwerre Airport Road is known to all as a road abandoned by the failed Amaechi administration at less than 30 percent completion. Dakuku was in the country at the time the Rivers State Government flagged off the completion of the road after awarding it to Chinese contractors, CGC. The flag off was done by the Deputy Senate President Ike Ekweremadu. I remember Rivers APC mocking Governor Wike that too many projects had been flagged off. Over the period, the road was constructed and delivered. Dakuku comes up to say that motorable road was there. How low can a weak politician get? Done with the Rivers audience, Dakuku Peterside moved over to Lagos State to organise a media roundtable specifically to lie against Governor Wike. Dakuku forgot that Lagos is one of the worst hit by the mal-administration of the APC Federal Government. Today, Lagos has degenerated to the worst livable city in the world. Nigeria is now the poorest nation on earth overtaking India. At this media roundtable, Dakuku Peterside was reported to have blasted the media for hyping Governor Wike and presenting him as Nigeria’s best performing governor. According to Dakuku Peterside, Governor Wike should not be praised to high heavens. He claimed that Governor Wike has not performed as reported in the area of healthcare delivery, education, sports, road infrastructure and security. Incidentally, the areas listed by Dakuku during his media roundtable are key sectors where Governor Wike has been outstanding. Though, the Rivers State Government is not in control of the security infrastructure, Governor Wike has through careful planning and investment made Rivers State one of the safest states in the country. This is one of the few states where there is no banditry, dare-devil bank armed robbery, herdsmen activities, extreme cultism and un-mitigated communal clashes. Within the last three years, Governor Wike has donated over 300 Hilux Vans to security agencies, purchased armoured vehicles for the security agencies and strengthened the State Anti-Cultism/Anti-Kidnapping Laws to create the right environment to tackle security challenges. Governor Wike also executed a successful amnesty programme which reduced the deadly effects of cultism and kidnapping. Today, in Nigeria, one can safely say that Rivers State is one of the safest states in the country. More than 22 States of the Federation have witnessed mass deployment of armed forces to quell one form of major crisis or the other. Rivers State is not one of them. Dakuku Peterside talked about unemployment in Rivers State. He forgot that he works for the failed APC Federal Government that has destroyed the economy leading to the loss of 10million jobs in less than three years. In Rivers State, Governor Wike has kick-started the direct employment of 14,000 staff in the Ministry of Education. Ten thousand teachers and four thousand non-academic staff. The State Neighbourhood Safety Corps Agency is recruiting a few thousand operatives. The State Government has set aside N1Billion as interest free loans for traders and young entrepreneurs. Disbursement will be N200million monthly. There is also a direct empowerment scheme for 10,000 women from the 23 Local Government Areas who will be financially supported by the Rivers State Government to improve their respective businesses. With the over 500 mega and medium sized projects executed across Rivers State, the job component is mind-blowing. We are talking about over 200, 000 direct and indirect jobs. We are talking about the revival of an economy that was destroyed by Dakuku’s Oga. We need to remind Dakuku that his Oga was so irresponsible that he failed to prepare a handover note. He was ashamed of his legacy of corruption and plunder of the state coffers. Dakuku in his self-induced amnesia forgot that Governor Wike paid four months salary arrears and six months pension arrears swallowed by the failed Amaechi administration. Things have become so sweet in Rivers State that these deadly kidnappers of resources think everyone else cannot remember their days of darkness. Due to embarrassing collapse of urban and rural roads in Rivers State, the first project of Governor Wike was Operation Zero Potholes. He left Yakubu Gowon Stadium without after his inauguration and flagged off the most profound road construction, rehabilitation and reconstruction in the history of the state. It was executed by Julius Berger, CCECC and other international companies. Today, Diobu, PH Township, Borikiri and other neglected suburbs are now enjoying the presence of government. The third year anniversary of Governor Wike revealed another aspect of his state-wide road delivery. In few days, the Governor commissioned over 70 roads in the three senatorial districts. They comprised internal and inter-local government roads. The Health Sector is grateful to Governor Wike. The Nigerian Medical Association leadership in Rivers State says this is a golden era. They are right. Thirteen General Hospitals spread across the three senatorial districts have been reconstructed, equipped and made functional. The Medical College of Rivers State University initiated and completed by Governor Wike, while the Braithwaite Memorial Specialist Hospital has been upgraded to serve as a Teaching Hospital. The celebrated Mother and Child Hospital has been completed awaiting commissioning. Zonal Hospitals at Bori, Etche, Degema and Ahoada are nearing completion. There is no need to mention the N500million Loan Scheme initiated and funded by the Rivers State Governor for private health practitioners to upgrade their facilities for service to Rivers people. In sports, Governor Wike revived the Diete Spiff Civic Centre where the State hosted the African Wrestling Championship that attracted 51 African Countries. Port Harcourt was an alternate home for the Super Eagles while the State Government flagged off the ongoing construction of the Real Madrid Football Academy in Rivers State. In the education sector, Rivers State has witnessed a revolution. Over 200 basic schools have been reconstructed and equipped in the 23 LGAs. The State Government has reintroduced boarding secondary education, thereby upgrading selected secondary schools in the three senatorial districts. The Rivers State University has been re-positioned with the completion and commissioning of key faculty buildings. The list goes on. Need we talk about the justice sector where Governor Wike has turned Rivers State into the judicial hub of the country. From a state where failed Amaechi closed the courts to a state where a new Federal High Court Complex, Magistrate Court Complex, National Industrial Court, Rehabilitated Appeal Court are sitting pretty. The Judges Quarters is over 60 percent completed. Or the special projects like Port Harcourt Pleasure Park, Rumuokoro Market and Park, Government House Chapel of Everlasting Grace, Rivers State Ecumenical Centre, Traditional Rulers Secretariat, Bonny-Bille-Nembe Jetty, Rex Jim Lawson Cultural Centre , Civil Servants Quarters, Produce House etc. Ever since he was sworn-in, Governor Wike has administered the state transparently, working with the Rivers State House of Assembly to promote pro-people budgeting and best practices . The economy of Rivers State has been so re-invigorated that June Salaries were paid despite the fact that the failed APC Federal Government refused to release FAAC Allocation for that month. Over 33 States of the Federation could not pay salaries at the time. Dakuku Peterside held his media roundtable in Lagos because his outings in Rivers State ended in fiasco. It has been one shouting match after the other because journalists have always taken turns to highlight key indices of development and outstanding projects by Governor Wike. Running to Lagos to address a select set of reporters without knowledge about Rivers State shows that Dakuku is yet to come to terms with reality. He has been rejected and begging for media mileage in a foreign land will further alienate him from the people. The reality on ground in today’s Rivers is that nobody will defeat the people’s governor. Rivers people through the anointing of God has settled for Governor Wike. The endorsements have come from the 23 Local Government Areas of the state. Dakuku should make do with his media roundtable. A man who is even scared of resigning from the pot of soup extended to him by his Oga should not be taken seriously. If he likes, let him select journalists from Syria for a roundtable, Rivers people will have nothing to do with a politician whose only credential is the ability to lie without basic logic. But a poser to our celebrated Houseboy. Apart from excuses, what has his oga attracted to Rivers State by way of federal presence ? Absolutely nothing.